Tomonobu Itagaki, the head of Team Ninja who develops the Ninja Gaiden games for Tecmo, is a pretty outspoken game designer. Luckily he has the credentials to back it up with DOA, and the rebirth of Ninja Gaiden under his belt he can talk as much smack as he likes. 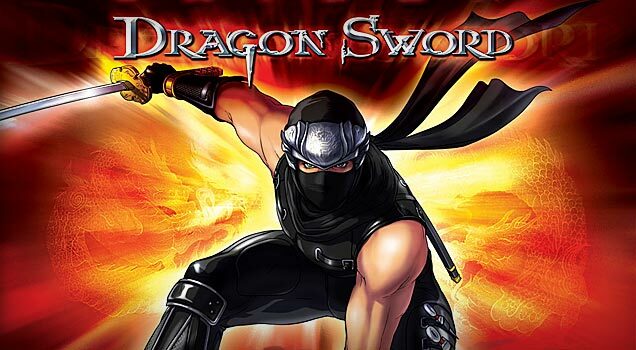 But still when Ninja Gaiden: Dragon Sword was first announced it was hard not to be skeptical. First the game would be on the DS, a system not known for the type of blood and gore that appeared in the blood soaked Ninja Gaiden on the 360. Secondly, it would be played while holding the DS sideways. Thirdly, and most importantly, it would be played almost completely with the stylus. All these things added up to a lot of questions. How would the lightning quick attacks of Ryu Hayabusa function with the new touch controls? Could you really get the same gameplay and style on the screens of the DS that the Ninja Gaiden franchise has become known for? How would an action game fare on vertical screens, a design mostly reserved for more slowly paced games in the past. Most importantly though, would a portable version of Ninja Gaiden be on the same level of quality and offer the same level of challenge that its predecessor did? Well the game is out now, so let’s see if we can have the answers to all these questions. Ninja Gaiden DS is supposed to function as a bridge story between the original Ninja Gaiden and Ninja Gaiden 2 coming out later this year on the 360. The story picks up sixth months after the first game and we find Ryu Hayabusa living peacefully in the rebuilt Hayabusa Village and training a new temple priestess, Momiji, who the player actually gets to play as in the opening tutorial. She is quickly kidnapped by the Black Spider Clan who wants her for nefarious reasons that involve some very high level Fiends (what the mythical bad guys are called in Ninja Gaiden). Ryu then must go on a quest to rescue her and once again save the world from evil. To do this, it turns out, he must collect 8 Dark Dragonstones containing the will and essence of the Dark Dragon. Yes, the same Dark Dragon that forged the Dark Dragon blade in the previous game. Remember this is all tied together…loosely. As you can probably tell from the mere mention of collecting 8 eight objects of any kind the plot, which unfolds via magma style cut scenes, plays out pretty straight forwardly. You progress from level to level via an over world hub, each level consisting of battling through rooms to get to the head boss and killing said boss for the stone. Each stone opens the gateway to the next level and you progress via the tried and true method of collect and advance. Ryu can upgrade his sword, get more life and buy new Ninpo magic attacks between levels with the essence he collects from killing enemies but otherwise the game plays like a down and dirty action game with plot taking a back seat to ninja fighting and quick and challenging levels. Which is all fine, this is a portable game after all, not a massive console masterpiece. It’s meant to be played short and quick and the game knows it. What the game doesn’t seem to realize is that the DS is the graphical underdog in the world of portable gaming. Ninja Gaiden: DS is one of the best looking games out there for the system. Ryu and his enemies look and move impressively well, especially when it comes to collision detection and enemy reaction. The 3D models are crisp and clear and more detailed than I would expect from a DS game. The backgrounds are all painted and not in 3D but instead of being a hindrance and making the game look dated they actually add a certain amount of character to the whole experience. This is helped by the fact that most of them are absolutely gorgeous and that the comic book cut scenes are done in much the same style. The level design team also did an amazing job of making the world work vertically instead of horizontally. Wall jumping up a long vertical pit for the first time looks and feels great on the sideways held DS. Pretty graphics don’t mean anything without good gameplay behind it. Luckily Ninja Gaiden: DS’ controls work very well, not entirely flawlessly, mind you, but well enough to show that this is a great, and possibly preferable, way to control the ridiculously quick Ryu. All the controls, except for blocking which is handled by pressing any button, are done with the stylus. Touch the screen and Ryu will run in that direction. Tap an enemy and he will throw a shuriken at them. Slash an enemy and Ryu slashes that enemy. There’s a combo system that is ridiculously easy to pull off and targeting from one enemy to another, something I’ve always found annoying in action games like this, is sublimely simple with the stylus controls as all you have to do is slash over the enemy you want to attack. Ryu even has a charged attack which is performed by rubbing the screen quickly. The greatest fear I had for the game was that the smoothness of the fighting in Ninja Gaiden wouldn’t be able to transfer over with the touch controls. This fear was totally unwarranted. The stylus controls make battling even smoother than before, there is no possible way you could move Ryu this fast with standard button controls. The second fear I had was that the battles would simply become hack and slash affairs with none of the strategy that you were forced to play with in Ninja Gaiden on the 360. This fear also turned out to be unwarranted, as most of the battles you find yourself in require a decent amount of dodging, well timed blocking and grasp of what is going on and when to attack. The controls aren’t perfect though. While never annoying to the point of being a problem every once in a while the game will mistake a slash for a jump or a shuriken throw for a slash. Also disappointing is the lack of move sets. You can increase your combo length via slashes and there are two types of jump attacks plus a counter, but there is only one official “special move” that gets pulled off with a series of stylus movements over an enemy. By sliding the stylus down on an enemy, knocking them downwards, then up, flinging them into the air, then up again, causing Ryu to grab them midair and body slam them to the ground, you can perform a powerful attack. The attack is so much fun to pull off and so visceral, because the movements go along with your stylus touches, that the first time you pull it off you can’t wait to unlock more moves like it. Unfortunately there aren’t many more. A game that could have been replete with amazingly visceral combat maneuvers is disappointingly void of them. Still, the ones it does give you are so much fun that they never really get old. So we’ve got these great, intuitive, fun to use controls but is the rest of the game surrounding them any fun? Of course it is. Each level you hop into has a different theme with their own unique challenges and progressively harder enemies. Basic enemy design is fantastic with bad guys who movie quickly and are tough to hit too big bad powerful creatures who can take tons of damage. Most battles you find yourself in involve a combination of long and short range enemies and some even involve traps on the floor to further damage you. At times you can be surrounded by a large number of enemies, which the DS handles without any slow down, and have a pretty difficult fight on your hands. Sadly the difficulty level never really reaches anything close to Ninja Gaiden (any of them). While challenging and fun to play the game never really provokes that good kind of aggravation that truly challenging games can. This is extremely apparent in the boss battles. Each level ends with a “different” boss. I put different in quotes because really there are only two kinds of bosses. One where you roll around the boss, slashing at him until he’s dead and the other where you shoot the boss with distance attacks until he falls over and you can slash him with your sword. There are variations on the norm, obviously, but the boss difficulty never really seems to ramp up much and if you’re good at dodging (and there is no reason you shouldn’t be) then you won’t have that hard a time with any boss except at the end. The problem, I believe, stems from the fact that the battle system is set up for multiple attackers and large single bad guys just don’t work as well with it. What is a testament to the games great controls and general gameplay is that none of these fights ever get boring, even the bosses. The game could have easily become a repetitive compilation of room after room of battles, especially with its incredibly straight forward progression style but it never does. Battles are consistently engaging and enticing and while the Ninpo magic spells, which are cast by tracing a symbol presented on the screen, are mostly used for solving puzzles they also add a bit of fun and variety to each fight. Nothing like sending bolts of lightning through a fiend who just crushed your head. But I’ll give it to you anyway. The game is a blast. It’s quick, challenging, fun to play and a pleasure to control. All the “risks” the game took really paid off as Ninja Gaiden is not only the best action game on the DS (admittedly not that difficult a title to claim) but one of the best games in any genre on the system. It’s polished and looks great, but most importantly it doesn’t try to do too much and instead does what it wants to do really well. You won’t find the complex plot or gallons of blood that Ninja Gaiden on the 360 brought us but you will find the same crisp fighting and lightning quick attacks. If you’re looking for a game with a good amount of depth but is also easy to play on the go, thanks to frequent save points and shorter levels, then Ninja Gaiden: DS is perfect.